The right product at the right price ! Quality battery, best price, excellent delivery. Tres bon service en ligne. Last just about 2 years as power source for electric outboard, cheaper to run than a petrol driven one and less smelly! Must be used with a smart charger, which is kinder to the battery. Cheaper batteries have only lasted a handful of months. Tayna got me out of a spot of bother with a very quick delivery and the battery is well priced and perfect for my camper van. Thanks, well recommended. Very pleased with this so far. Time will tell. Ordering and delivery typically efficient. Easy to order on line at a competitive price and very quick delivery. Installed in our caravan and at this moment all appears good. Will be using it properly in 4 weeks. Items delivered promptly,very well packed and are as described.Great service,thank you. 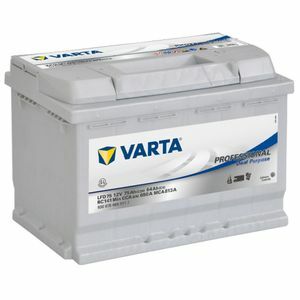 I am unable to comment on service life until they have had some use but hope that they will match the performance of the previous set of Varta batteries purchased from Tayna in May 2013.These are still in service ( on a boat ) but are probably reaching the end of their useful life. Perfect, the battery arrived as promised, fitted and works. Thank you, excellent service. Excellent produit livré très rapidement!! Does what it says on the side. Quality product! very good service,time will tell if product is good. Very happy with the whole process, from ordering to speedy delivery.